Hey lovelies! I hope you all had an amazing Christmas and got everything that you wished for! With the Christmas festivities coming to an end and a whole new year approaching, I imagine everybody has been going crazy in the sales, planning the outfit that you are going to drink, dance, hug and kiss your way out of 2013 in. This year, USC have provided me with my sparkles with this gorgeous embellished flapper-inspired number (that, may I add, is now in the sale for £29 for the set instead of £58!). The At Republic range at USC is packed full of party-perfect pieces this year, so make sure you check it out if you haven't sorted your outfit out already! A couple of weeks ago I experienced my first ever Clothes Show Live in Birmingham. Mind blown was not the word to describe how I felt when I wandered in to the huge exhibition space to see thousands of people bustling around the hundreds of beauty and fashion stands, food wagons and catwalk shows. One thing is for sure, I'll definitely save up a bit of money next year, it's definitely not a happy place for a poor person to be. However, shopping wasn't my first priority at Clothes Show Live this year. 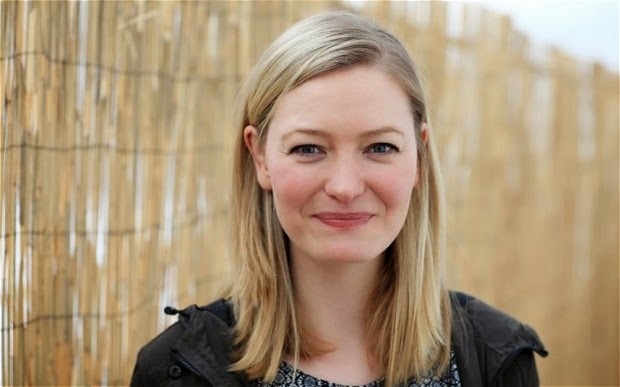 I was invited along to meet lovely author, Holly Smale to interview her on her latest release, Geek Girl: Model Misfit. Over a Starbucks and the occasional exchange about how huge the Clothes Show was and how terribly unorganised we both were for the occasion, I found out a little more about her novel. Having jotted down stories since the tender age of five years old, Holly is literally living the dream as a product of her imagination finally hits the shelves and becomes a best seller at number 6 on the charts. Back at Clothes Show Live, the place that first inspired her to write Geek Girl, she keeps her feet on the ground and greets me with a humble smile and a friendly chat. "Geek Girl is about a girl who is unpopular at school and is spotted by model scouts. She thinks everything is looking up for her from here, but how wrong she is", Without giving too much away, Holly briefed me on the book which I instantly though was very Princess Diaries-esque. A romantic comedy suitable for girls (and guys if they're in to that sort of thing!) 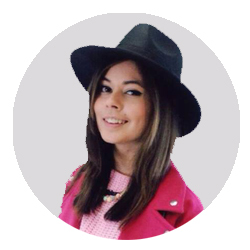 aged 11+, Holly describes how she doesn't write with a certain target audience in mind but keeps her books free of swearing and sexual references. 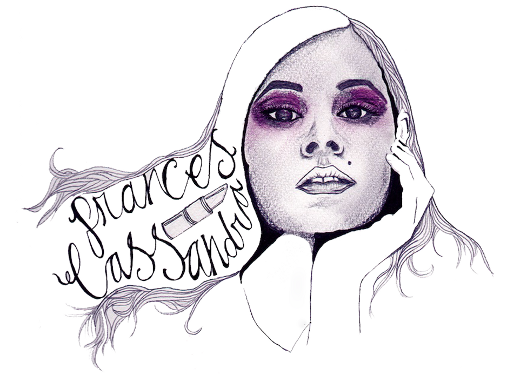 By writing with her "inner child", she produces a work that everybody can enjoy. Geek Girl and Geek Girl: Model Misfit can be bought at all major bookstores or online at Amazon at an RRP of £6.99 each, so they're a perfect gift for any young girl, or even if you're looking for an easy read yourself. With two books already a success, I had to ask Holly if a third was imminent. "Yes, a third book is currently in the works. We may also be in talks about a film, but I can't tell you too much about that! Geek Girl actually gets launched in America in January 2015, so we have to wait and see what happens there first". Okay, Holly! We'll be watching this space! If you'd like to learn more about Holly and her works, you can find her on Facebook and Twitter. Have you read any of the Geek Girl books? I'm so late to the trend that I'm not sure it's even a "trend" any more, but I fell for these joggers and decided that they were too nice to be reserved only for gym sessions, so I took on F+F's "How You're Wearing It" challenge to show how I'd style these bad boys. The idea of wearing something sporty with jewellery and a pair of killer heels never crossed my mind as "right", or as something that I would ever be able to pull off, but I think the stylish PU stripe on these F+F trousers pulls the outfit together and stops me from looking like a mis-matched mess. If I'd have known that I could go on a night out wearing a pair of jogging pants, I would have done it a long time ago! Are you a fan of sports luxe? If you're looking for an extra something to give to your mum, your grandma or your aunt for Christmas, a bouquet of flowers is always a safe bet. 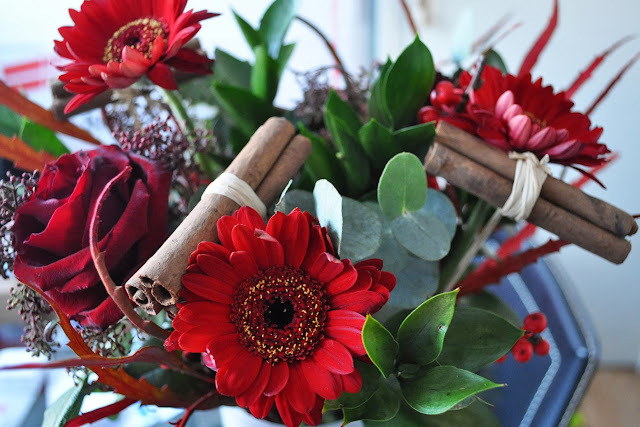 Debenhams have brought out a range of festive bouquets to suit the occasion, made up of a selection of gorgeous red, white and green blooms. 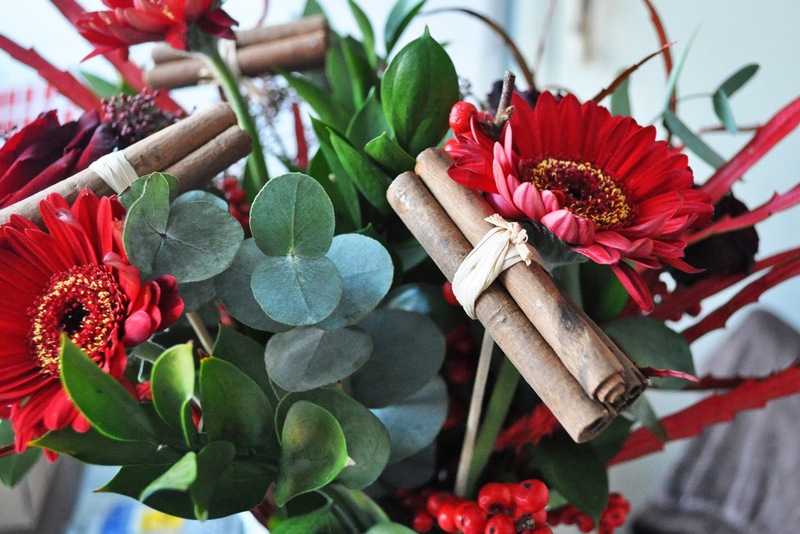 I was sent the Cinnamon Spice bouquet to review, and whilst I am a little disappointed at the lack of cinnamon fragrance, I agree that the Grandprix roses, cinnamon stick bundles and bunches of red berries make a very pretty arrangement which screams Christmas from it's vase on my dining room table. As usual, the flowers arrived unscathed in a sturdy box complete with some plant food to keep your bouquet looking great for as long as possible- Mine lasted for nearly two weeks before it started to look a little droopy! Debenhams Flowers have kindly given me a discount code for £5 off all Christmas gifts until December 21, 2013, so if you fancy treating somebody to a pretty bunch of flowers (or even a nice bouquet to use as a dining table centre piece on Christmas Day), check out their full range here and don't forget to enter XMASBLOG at the checkout! 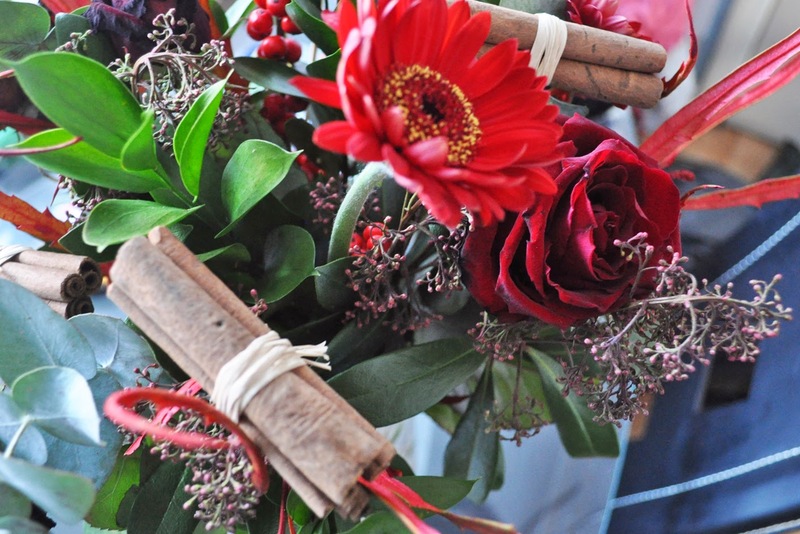 Will you be treating anybody to a bouquet for Christmas? I'm sure within every family or circle of friends there is somebody who is an absolute pain to shop for (boys, we're looking at you!). That's where gift websites such as Treat Republic step in to help and I don't think that you can go wrong with a personalised gift. Treat Republic has a huge collection of personalised gifts, ranging from kitchen utensils and cushions to glasses, mugs and jewellery, so there's something to suit everybody- even your pets! They have kindly teamed up with me this month to offer one of my lovely followers a gift of their choice, whether it be to tick something off their Christmas shopping list or to treat themself to an early Christmas present. 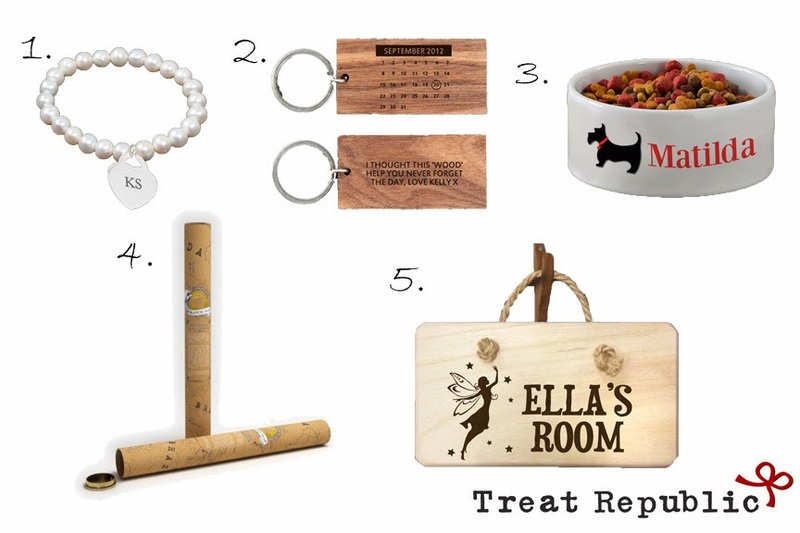 The winner will receive an item of their choice up to the value of £30 from Treat Republic's Personalised Range, so I've picked out a few of my favourites to help you decide! As always, entries will be made via Rafflecopter and the rules are written below. -This giveaway is open to the UK only (I'm sorry!)! -Use the Rafflecopter form below to enter. To enter, you must be a follower of my blog via GFC or Bloglovin' and "like" the Treat Republic Facebook page. There are plenty of optional entries too! -Please note that I run these giveaways to say thank you to my loyal followers. Entries will be checked and accounts created solely for the purpose of entering giveaways will be disregarded. - The giveaway will run for ten days and will end at 11:59PM BST on Thursday, December 12, 2013. Good luck! Let me know in the comments what you would like to win! *DISCLOSURE: Collaborative giveaway. Treat Republic are kindly supplying the prize for this giveaway.